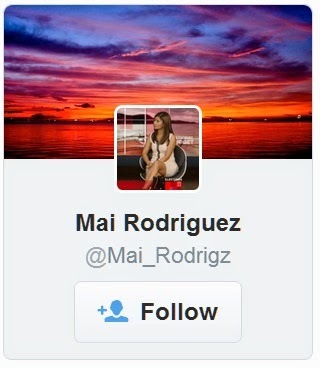 Mai Rodriguez knows the news business. 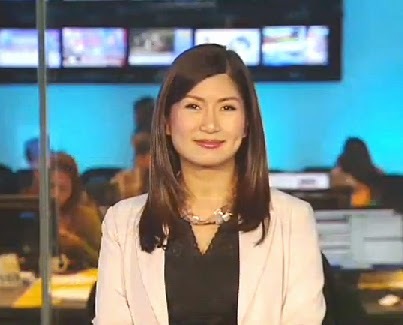 Before anchoring her first solo newscast almost two years ago, Rodriguez was an accomplished producer and a network talent on the ABS-CBN News Channel. "ANC molded me into who I am today as a broadcast journalist. I was a news writer first before taking on many hats in ANC — I became an EP and weather reporter then news anchor/EP, so I've discovered I'm a great multi-tasker," she says. Rodriguez started her career as a news writer in 2000, then eventually promoted to a higher position as segment producer. She would later go on to become a network field reporter and features anchor, while also juggling work as executive producer of various Studio 23 and ANC programs such as News Central and Dateline Philippines. Today, Rodriguez is among local news' go-to noontime anchors — joining the elite ranks of Pia Arcangel, Martin Andanar and Pinky Webb, just to name a few — and a highly respected weather presenter seen nightly on Solar Network News. 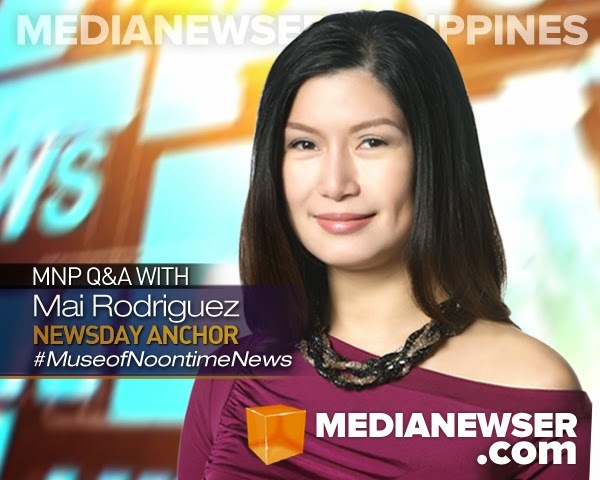 We talked to Rodriguez, the "Muse of Noontime News," about her career as a broadcast journalist, her take on social media, and why she left ANC to join Solar News. Guiding Principle: The only real failure in life is not trying. Don't be afraid to take on new challenges and risks. If I'm not pushing myself beyond my comfort zone, I'm not really living. Did you always dream of becoming a journalist? When I was a child, I wanted to become a writer, a novelist. But I also wanted to be many things. In the end, I'm just happy that I get to do something that I love to do. What obstacles did you have to overcome to get to where you are right now? Nothing really dramatic. But I was extremely shy and insecure as a kid. But over the years, you realize life is just too short to hide from the world. I was also a single parent during the first decade of my career, but having a great support system helped. I have an amazing mom! Besides your solid journalistic background and experience, what did you bring with you from ANC that made your transition that easy to Solar News Channel? ANC molded me into who I am today as a broadcast journalist. I was a news writer first before taking on many hats in ANC — I became an EP and weather reporter then news anchor/EP so I've discovered I'm a great multi-tasker. How would you describe your experience on ANC? It was my second home for over 10 years, I've stumbled and learned in all those years and I'm grateful for the experience and all the good memories. I've developed what I hope to be life-long friendships with many of my colleagues there. Ultimately, what made you decide to transfer to Solar News Channel? It's the first all-English news channel to be aired on free TV in the Philippines. I've followed TalkTV even before it was SNC because I watch the foreign programs from CBS and NBC — I love the Today Show! But ultimately, I believe in the network's vision. Our bosses are passionate about contributing to the nation, of giving relevant and in-depth news to a wider audience. Zero fluff. News that you can actually use and apply in your daily lives. I know we've said this before but Newsday is really one of the best local newscasts out there. Looking back two years ago during its launch, were you nervous about the idea of anchoring your own newscast? What are some of the most challenging stories you have covered/produced in your decade-long career, and how did that make you a better journalist? Most challenging were the heart-wrenching ones and breaking news. To mention a few — the Rizal Day bombings, the Sipadan hostage crisis, the onslaught of Ondoy, and I was also sent to cover the landslide in St. Bernard, Leyte. These were breaking news coverages that stretched on, and it was of utmost importance to provide viewers with the freshest developments, to give them news as it happens. Amid a backdrop of wide-ranging problems, it's also important to tell the human side of these stories. You also executive produced newscasts like News Central and Dateline Philippines. How was it like working behind the scenes as EP? Very rewarding, despite the stress. In putting a news show on the air, I always ask, “what does my audience need to know?” Producers must make sure they’re putting out the most recent and important news, and while airing, we must be flexible to change the lineup with seconds to spare. Very exciting. Extra exciting if there's a newsroom crisis [laughs]. But seriously, it's a bonus if you somehow make viewers care about the news, about what's happening in the country and the people who run it. Having the experience, do you get to apply that and have an input on Newsday? You said in one of your interviews that you would like to "cover feel good stories, and feature helpful tips for moms." Will you be able to do that soon on the newscast? Definitely, there's input — on the content, on who to interview. I also copy-edit my scripts. In the near future, one of the goals is to tell the story of everyday heroes. As the Solar tagline goes: Inform and Inspire. Being a new mom myself, I also want to share inspiring stories for busy moms, and tips on parenting and early childhood development. Currently, we have Money Talks on Wednesdays- a segment for budding entrepreneurs and to help viewers plan and balance their finances. What for you is the key in building great relationships with co-workers? Be honest, trustworthy and dependable. You have to deliver. Pia, I assume is one of your media mentors. How does it feel working with her on a nightly basis? I get to learn a lot seeing how Pia work. She's dedicated, she's one of the best interviewers out there and she's excellent at what she does. When you first pitched the social media segment on ANC @ANCALERTS, it was such a fantastic idea given the boom of Twitter and Facebook. Were you surprised when ANC eventually turned your brainchild into a full-blown newscast? I'm not sure if it was called ANCalerts back then, but I did have a social media segment every hour of the afternoon news. Not really surprised that it's a full-blown newscast now, because social media is an exciting world. The Philippines was named the 'Social Networking Capital of the World' for a reason. It's amazing just how high Twitter usage is — we can make something go trending worldwide. There's a whole treasure trove of stories even only from what people are talking about online, and what photos/stories netizens are sharing. Speaking of social media, are you active on Twitter? Whose/what accounts do you regularly check on Twitter? I'm on Twitter, @Mai_Rodrigz. Embarrassed to say that I only tweet occasionally and I'm not tech or online savvy. But I keep myself updated because I follow CNN, BBC, some of the newsmakers and newshounds here and abroad. What's the rewarding thing about working in TV news? You get to be part of history. You're in the thick of changing and evolving world events. You get to report about landmark rulings, innovations, milestones. Things that impact our lives. News as it happens. I don't know if it's just me, but in a really big news day, most of the time it's a bit of a downer when it's all over and you're off the air. Do you think looks do matter to become a more effective on-cam news talent? In your case, do you think it has given you any advantage/disadvantage? More than looks, I think it's important that you speak clearly, you have good diction, you have presence of mind, and you look pleasant enough on TV. In my case, I'm hoping it's more of talent than looks that got me the job [laughs]. What's your take on payola journalism? It's sad and unfortunate. But it's also an example of how pervasive corruption has become in our society. But it will be tragic if this is accepted as being part of the trade. How do you find a work-life balance with a very busy schedule? It helps that with this job, you don't take your work at home. Of course I still read the top stories and watch the news at home, but after that, I've taught myself to shut it out and focus on family, especially my baby, when I'm not in the newsroom. I've found that my baby is the perfect stress reliever. What do you consider your greatest success to date, both personally and professionally? Professionally, I think it has yet to come. And your biggest disappointment, if there is? What do you like to do next on Solar? Do special reports — focus on environmental issues, climate change. And like I've said earlier, to tell the story of everyday heroes. Inform and inspire. First, know where your skills lie and what your passions are. Challenge yourselves. Constantly improve. Push yourself harder. Keep questioning how you can do things better. Be prepared to handle stressful situations and keep your composure. Learning how to keep calm in the middle of chaos is very important since news is completely unpredictable.